Sara’s note: We’re excited to tell you about one of the Goddard-built balloon-borne astrophysics missions launching this week! This is a guest post (and photos) from Dr. Stephen Rinehart. 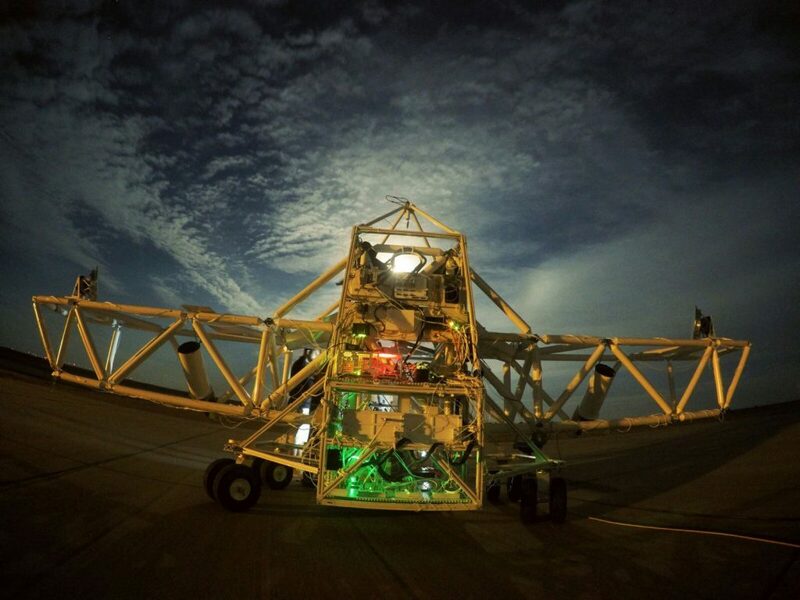 The Balloon Experimental Twin Telescope for Infrared Interferometry (BETTII) is a 8-meter long far-infrared interferometer designed to fly on a high altitude balloon. BETTII observes at wavelengths between 30 and 90 microns, allowing it to probe deeply into dusty regions of the universe, such as star forming clusters. Two collector mirrors, separated by 8 meters, each collect light from an astronomical source; by taking advantage of the wave nature of light, the two different beams can be combined into a “fringe packet” — the source alternately gets bright and then gets dark as the relative length of each arm is changed. The advantage of this is that it provides the equivalent angular resolution of an 8-meter telescope, allowing us to (for the first time) resolve sources in crowded regions. An important part of getting BETTII ready for flight is testing it outside, looking at stars, so that we can characterize the star cameras in our control system. All those indicator LEDs give BETTII light of her own. This picture was from the first time we took BETTII outside in Fort Sumner, NM, in August 2016. We built BETTII to fly on a high altitude balloon for a couple of reasons. At these wavelengths, we can’t observe through the atmosphere — the water vapor in the atmosphere simply produces too much light in this waveband. Ideally, an interferometer in space could open up a wide range of new science. 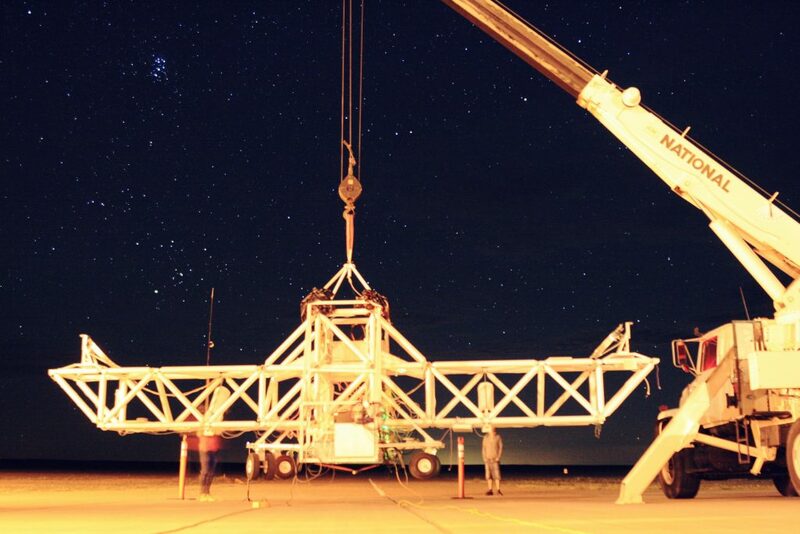 However, no spatial interferometer has ever been flown before — BETTII is serving as a technical pathfinder. The lessons we learn from BETTII, and our experience making it work, will have incredible value for designing future space-based interferometers. As part of the the BETTII project, we built a small test chamber that allows us to test components under the same conditions they’ll experience on flight — low temperatures (about -40 degrees) and low pressure (about 0.01 the pressure at sea level). This gives us confidence that everything will work right once we get to float. This is BETTII’s first flight, and it is intended as an “engineering” flight. BETTII is a complicated system, and while the team has done as much testing on the ground as possible, the only way to validate the whole system is to fly it. The hope is that, from this flight, we’ll learn enough about the system to find any issues and improve the system. On the science side, we hope to observe clusters of star formation with BETTII. The young protostars in star-forming regions are obscured by dust and gas, so they can only really be observed in the far-infrared. But, the angular resolution of far-infrared space telescopes has never been sufficient to resolve the individual sources within these crowded fields. BETTII will resolve the source and get their spectra, allowing us to definitively test competing models of star formation, and gain a new understanding of the origins of stars. BETTII has two telescope assemblies that are used to bring the light into the cryostat. Each of these assemblies has four mirrors, and the whole thing is assembled and aligned before installed in the gondola. 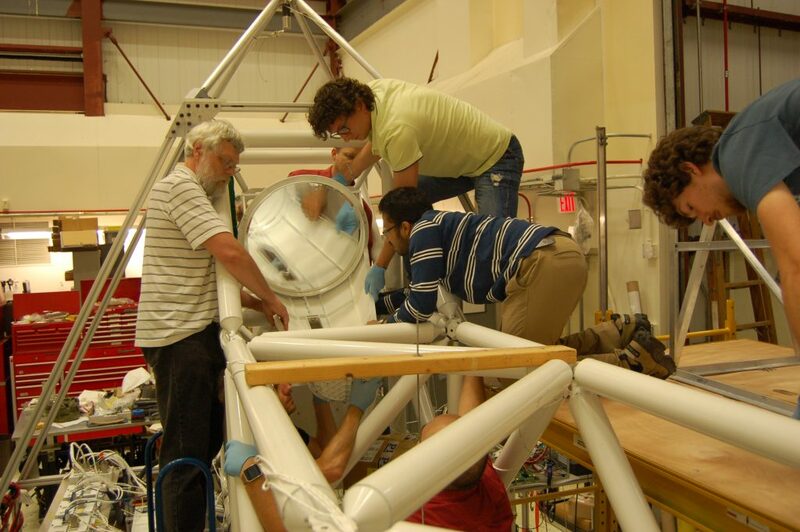 There are 7 people in this picture, all helping get one of the telescope assemblies installed. Development of BETTII began in 2011, and over the course of about 5 and a half years, we took the concept through design and construction. 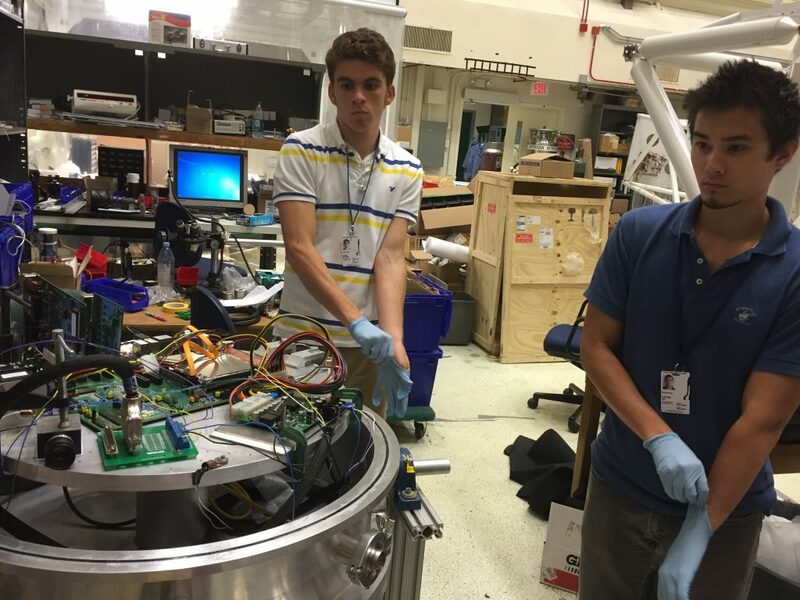 In the beginning, the team consisted of about 10 people from Goddard and the University of Maryland; as the project developed, the team evolved. Two graduate students from the University of Maryland, Maxime Rizzo (now a postdoc at Goddard) and Arnab Dhabal, took on key roles in the project, as did postdoctoral researchers Todd Veach and Roser Juanola-Parramon. Other team members on the flight crew include Dale Fixsen, Jordi Vila, Stephen Maher, Elmer Sharp, and new graduate students Fernando Esteves and Marc Casalprim Torres. Over the course of the project, about 40 (!) different undergraduate interns have contributed to the project as well — developing and testing star cameras, assisting with control system, electrical system, etc. BETTII only exists because of the contributions of all these students! We also test BETTII outside, hanging from a crane. This allows us to carry out more complete tests of the control system — but any surface winds can make this extremely challenging. While there will be winds at float altitude, the density of the air is about 100 times lower, so it shouldn’t be an issue on flight. BETTII is currently scheduled to launch the evening of June 8, 2017, from the Columbia Scientific Balloon Facility (CSBF) in Palestine, Texas. Keep an eye on @NASABlueshift and @NASA_Wallops for updates and a livestream of the launch! For more on BETTII, visit the project website.